"This is my own recipe...tried on family and friends and all gave their approval! Try them out, they're absolutely delicious!" Mix chocolate, banana, cream, and peanut butter together in a saucepan over medium heat; cook and stir mixture until melted (it may be partially lumpy due to peanut butter), 5 to 10 minutes. Pour mixture into a bowl and refrigerate until firm, 2 1/2 to 3 hours. Scoop chocolate mixture with a melon baller and roll into 1-inch balls. 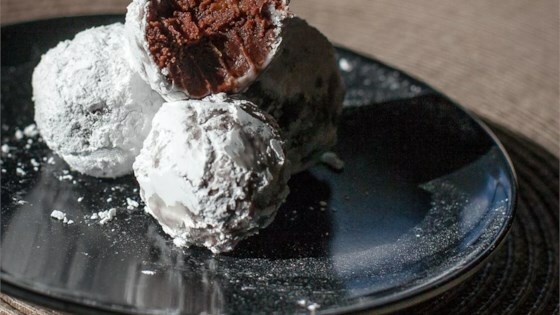 Place confectioners' sugar in a shallow bowl; coat truffles with confectioners' sugar and refrigerate until firm, 1 to 2 more hours. The combination of the chocolate, banana and powdered sugar were great, but I tasted little to no peanut butter. Overall, if you like the chocolate+banana combo, these are delicious! This is amazingly nummy! I added a hard chocolate shell before rolling them in powdered sugar.